I found a cool blog about food through PBS, and this recipe looks awesome! Kitchen Vignettes For her recipe visit her site on PBS. Beets and carrots, (like all cruciferous veggies also) need to be cooked in order for us to absorb the nutrients. I have changed her oriogial recipe to reflect healthier practices, like sautéing in butter, more seasonings. Remove the leafy tops from the carrots and beets. Reserve the carrot tops. (Beet greens can also be kept as they are extremely nutritious and delicious). Wash and scrub the carrots and beets, removing any soil, leaving their skins on. Place the whole carrots and beets in a large French oven or enameled iron pot and mix in the 3 Tablespoons butter, fully coating the vegetables in butter. In a 375 F oven, roast the vegetables for about 30 to 45 minutes, until tender when pierced with a fork. If you wish, once the beet are cool enough to handle, you can remove the skins from the beets by gently rubbing them off with your fingers. Caramelize onions in 2 Tablespoons butter until golden, about 30 minutes. Add garlic, sauté’ another 5 minutes. Add seasonings and sauté about 5 minutes more, until the spices are nice and toasted. Meanwhile, rinse the lentils and check them for small pebbles, then place them in the pan with the onions. Cover them with stock and bring to a simmer. Simmer on low to medium heat, covered, for about 30 to 40 minutes, until tender but not falling apart or turning mushy. (Add stock if necessary through the cooking). Drain the lentils and place them in a large shallow serving bowl. Add ketchup, tomato paste, adjust seasonings. Simmer another 1/2 hour. 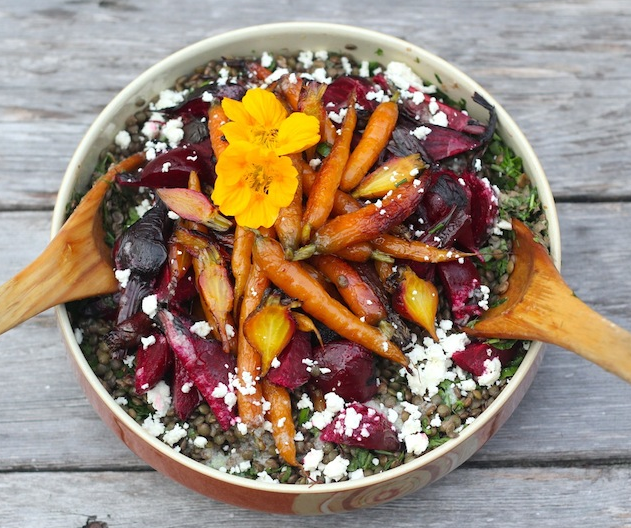 Place the roasted carrots and beets on top to serve.